With the new year underway, the Little Steps team has some updates and news to share concerning a new addition to our pediatric therapy team as well as continuing education. Here’s an overview of what’s happening this month and in the near future at Little Steps. We’re excited to announce that a therapy dog, Boomer, will soon join us at our clinics and help treat our patients. Boomer is a six-month-old miniature Australian Labradoodle (although he is getting pretty big, so he might not turn out to be as miniature as we expected). He recently completed training, and Jaime Neidenbach, one of our pediatric physical therapists, will lead a continuing education class soon to inform the rest of the team about the benefits of and techniques for using therapy dogs across a variety of settings and disciplines. Jaime previously took a few courses on dog therapy and fell in love with the idea of bringing a therapy dog to Little Steps. Our founder, Jaime Passaglia, agreed and supported adding a canine therapist to the team. 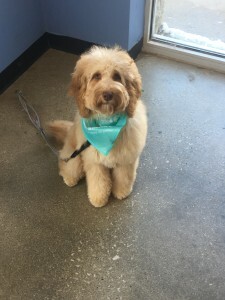 Boomer will assist with sessions at Little Steps’ Glenview, Highland Park, and Wilmette locations. He will also possibly spend time at the Chicago clinic, although that it is to be determined. At the moment, the plan is to bring him in to help calm children during therapy sessions. As mentioned earlier in this blog post, Jaime will lead a class covering the benefits of using therapy dogs, particularly for the pediatric population. She will also demo techniques for incorporating a therapy dog into on-site therapy sessions. This course will cover treatment tools, evidence-based strategies, and behavioral techniques for analyzing the behavior and actions of patients with high-functioning autism. Attendees will learn how to teach patients new skills to achieve social success. Additionally, the presentation will address how to overcome co-occurring behaviors, such as sensory issues, meltdowns, non-compliance, anxiety/rigidity, and ADHD. In this class, attendees will learn how to effectively treat pediatric patients with developmental challenges such as autism, cognitive limitations, traumatic brain injuries, and sensory processing issues, among others. The course focuses on evidence-based strategies to help children facing these challenges take part in daily routines. Our pediatric professionals are always looking to hone their skills and strive to provide the best possible care to help change the lives of children one step at a time. To learn more about pediatric therapy services from Little Steps, contact us today by calling 847-707-6744 or emailing info@littlestepspt.com.